Sewage backup cleanup can be a difficult time for property owners. These issues can cause other problems, such as property damage and health struggles. 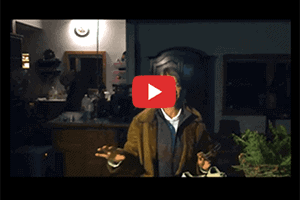 This is often a stressful situation for property owners. The sewage cleanup crew with 911 Restoration of Long Beach is here to help. The sewage cleanup team understands that these situations can escalate quickly, and need to be taken care of as efficiently as possible. The experts are available when you need them for your disaster cleanup needs. The team is available 24/7/365 so when you need emergency restoration services, they will come to your aid. It is important to take care of sewage cleanup as soon as possible, as any delays can cause further damage. Don’t wait to take care of this water damage emergency, contact our team today. Same-day service is offered, and the team can arrive within 45 minutes of a call. These prompt responses can save your property in a water leak emergency. A free visual inspection for property owners only is offered. Call 911 Restoration of Long Beach for your sewage cleanup services today. Black water emergencies on your property can be avoided by preventive measures. 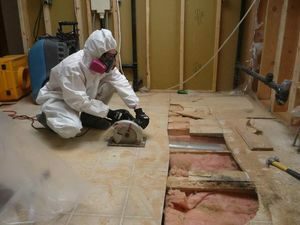 The team is trained to handle any kind of sewage cleanup emergency, but it’s important to understand the cause behind these water damage repairs as well. The truth about sewage restoration is that it is classified as category 3 water. This can be incredibly hazardous to your health because of the high bacteria levels in the sewage. Sewage cleanup emergencies often are caused from pipe backups or the toilet. Often when flushing in these emergencies, water can go up the shower. Another cause of sewage backup is home flooding. This can be caused from burst pipes or backup from the toilet. It’s important to never flush anything down the toilet that the pipes cannot handle. If this does occur, our sewage cleanup team is here to help. Older houses can also cause leaks as well since the pipes are not as secure and can easily burst. It can also be beneficial to have your plumbing system regularly inspected by a licensed professional. This can help stop any issues in their tracks before they get too big to handle. Collapsed pipes in older properties are also prone to backup as well. Flooding cleanup is necessary in these situations, and the disaster cleanup team is here to help. Call the sewage cleanup team to handle your water extraction emergency. No matter the water damage issue, the experts can take care of it and get your property back to normal in no time. The specialists help serve surrounding areas, including Carson and Seal Beach. 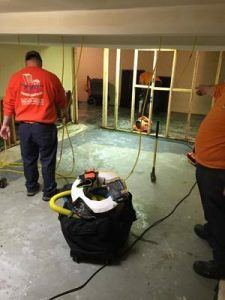 The sewage backup team in Long Beach is licensed and certified to handle any kind of water damage emergency. The water damage team works diligently to ensure the property will be back to normal in as little time as possible. The restoration company considers the house flooding and handles every case individually. This job should be left to the water damage professionals to avoid any kind of contamination or symptoms. The sewage cleanup team is available as soon as possible for any water extraction necessary. 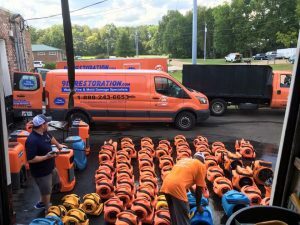 Sewage cleanup is considered a category three disaster, and the emergency restoration services are trained to handle this. 911 Restoration of Long Beach wants the customer to always be put first. There is opportunity for growth in any emergency. The team understands that sewage cleanup from burst pipes can be a stressful time for property owners. The emergency cleanup will be carried out as soon as possible to minimize damage. The sewage cleanup experts also sanitize the area, making sure to carry out any mold testing and cleanup. The mold removal company in San Pedro works efficiently if there is mold on the walls. The mold and mildew specialists clean up the area and make sure it is dry. Any possible mold growths or harmful bacteria are removed and the property is restored to the natural state. The basic water restoration is then conducted to ensure the property is sanitary. Once the water extraction occurs and any possible carpet water damage is taken care of, the property is then sanitized. From upholstery sanitization to wood floor restoration, all the sewage cleanup needs are taken care of. 911 Restoration of Long Beach works hard to provide property owners peace of mind during this difficult time. The water restoration specialists not only provide water extraction for sewage emergencies, but a positive attitude as well. The property will be ready for a fresh start in no time at all. 911 Restoration of Long Beach is here to help with any sewage backup emergencies to provide immediate relief. Call the team to help today!